I found this recipe in this month’s Southern Living and decided to give it a try. It was well worth the effort! This is not something you will whip up on a Saturday morning before everyone gets up. Instead, make them for coffee with friends, a special after-school treat, or a special dessert! First things first, and something I discovered while making this recipe, you are going to need 3 or 4 Granny Smith apples (depending on size. I used smallish ones and it took 4). Peel and dice the apples first. Don’t worry about them turning, you will use them fairly quickly. Stir together 1/3 cup firmly packaged light brown sugar, 1 1/2 TBsp all-purpose flour, and 1/4 tsp. ground cinnamon in a small bowl. Cut in 1 1/2 TBsp butter with a pastry blender or fork until mixture resembles coarse meal. Set aside, you will need it later. So, first thing you are going to do is preheat your oven to 375*F. Prepare Cinnamon Topping. Beat sour cream and the next 3 ingredients at low speed with an electric mixer 30 seconds or until blended. Stir together flour and next 3 ingredients. Add to sour cream mixture, beating at a low speed (VERY IMPORTANT! YOU DON”T WANT FLOUR FLYING ALL OVER YOUR KITCHEN! Trust me on that!) just until blended. (Don’t overmix!!!) Stir in the diced apples. Spoon mixture into a lightly greased 12 cup muffin pan. Sprinkle with the Cinnamon Topping. Now, after about 25 minutes, put all those yummy caramels into a microwave safe bowl (Make sure you take the wrappers off the caramels!) and add the cream. Microwave at High 1 -2 minutes, stirring at 30 second intervals. Let the mixture stand, about 5 minutes or until thick enough to coat the muffins. If the caramel mixture starts to harden before you finish dipping the muffins, just pop it in the microwave for a few seconds and stir. 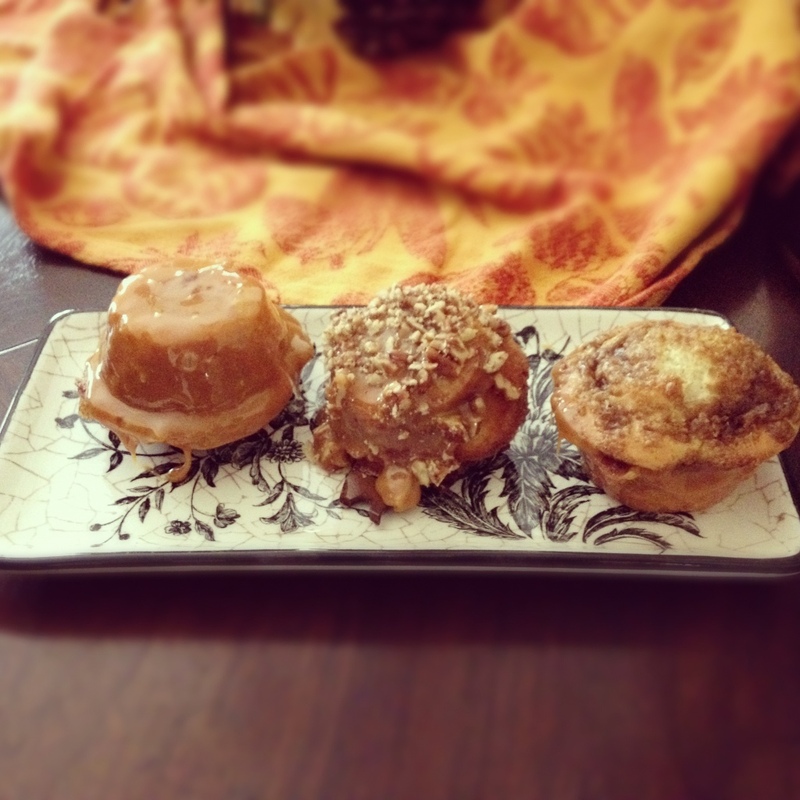 Insert food-safe twigs or craft sticks into caramel covered portions of muffins.